Bart Kimman at Northrop & Johnson in Hong Kong gets in touch to say there's a $915,000 price drop on the 27m motor yacht Pacific Conquest. 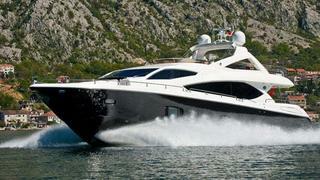 A Sunseeker 86 delivered in 2009, she’s equipped to a very high specification and sleeps eight guests in four staterooms. Twin 1,822hp MTU diesel engines give her a cruising speed of 23 knots. Pacific Conquest is fitted with air conditioning to operate comfortably in tropical areas. Her swim platform is hydraulically lifted and carries a RIB tender. Lying in Hong Kong, Pacific Conquest is down from US$4,615,000 to US$3.7 million.